LISA GODSON EXAMINES ARTISTS’ BANNERS THROUGH A MATERIAL CULTURE LENS, SITUATING THEM WITHIN THE BROADER HISTORY OF SOCIAL PROTEST MOVEMENTS. 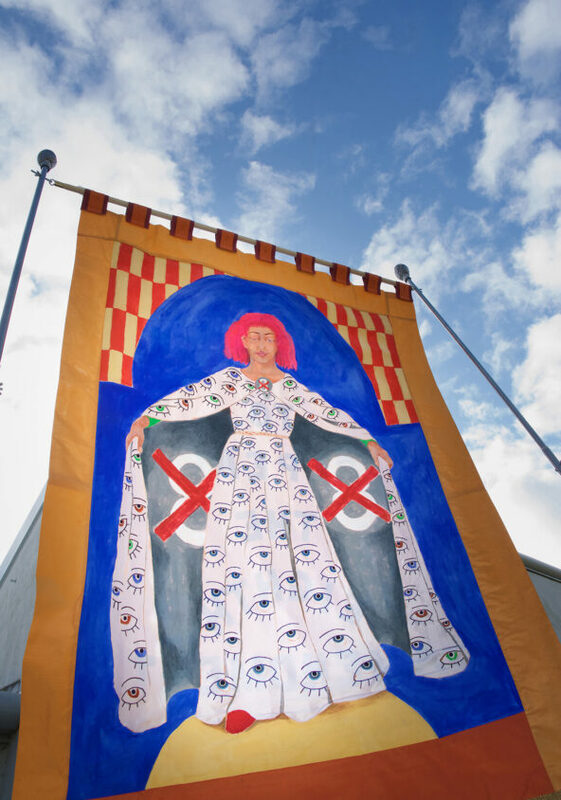 Among the placards, signs and posters held aloft at the sixth annual March for Choice in Dublin on September 30 were a set of remarkable banners created by artists Alice Maher, Rachel Fallon and Breda Mayock. As Fallon explains: “We had a meeting at the beginning of the year about what way the artists’ campaign could go, in terms of repealing the Eighth Amendment. It was important to do something that was ‘us’ and that spoke of our expertise in making things”. Until the early twentieth century, processions with spectacular banners were a widespread feature of civic life. Their vibrant colours and narrative content provided visual excitement as well as exhortation, amidst all manner of social gatherings and events, whether convening for religious devotion, political rallying or as part of the annual cycle of commemorative occasions. 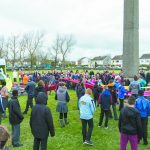 The practice of formal banner display on the island of Ireland now tends to be the preserve of conservative, even reactionary organisations, such as the Orange Order, the Irish National Foresters, the Ancient Order of Hibernians and so on. In keeping with their archaism, these organisations each flaunt their own particular claim on the past. Their banners bear iconography that invokes tradition and asserts continuation. This is aimed at servicing a teleology, where some foundation myth continues to uphold and reinforce present-day political claims. The banners of Maher, Fallon and Mayock likewise refer to the past, but in more oblique ways. Appropriating art historical tropes, as well as some of the conventions of formal banner design, the artists succeed in mobilising a new iconography that makes its own heroic claims, based on contemporary aspirations. The three full-size banners took approximately 6 months to make. 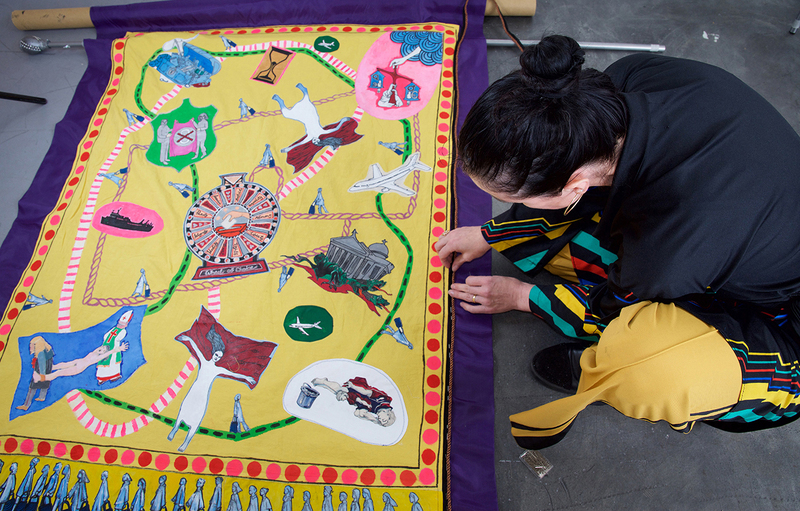 Their fabrication was preceded by a phase of research, which examined the tradition of banner-making and the appropriation of the banner format by contemporary artists. 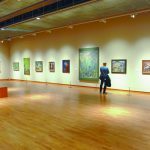 As well as their broad collective knowledge about the history of visual culture, the artists were informed by research visits to the Millmount Museum in Drogheda and to the National Museum of Ireland in Dublin. The unique collection of banners at Millmount includes those made for nineteenth century guilds and trade unions, such as the Drogheda Labourers’ Society and the Irish Show and Leatherworkers’ Union. Inspired by these historic artefacts, the artists adapted decorative motifs for their banners and incorporated images of gallantry and the dignity of labour. The first banner in the triptych involves a hieratic female figure with an outstretched cloak covered in embroidered eyes, in visual reference to the German Schutzmantelmadonna (Sheltering-cloak Madonna) or Madonna Misericordia (Virgin of Mercy), a recurring religious motif depicted, among many others, in a painting from the 1460s by Italian Renaissance painter Piero della Francesca. But rather than della Francesca’s gesture to protect the penitent and the prayerful, or the Irish confraternity banners that typically depicted insipid virgins of submission, this ‘Madonna of Repeal’ reveals the ‘Repeal the Eighth’ symbol on the lining of her cloak and as a clasp on her neck. Maher explains that the eyes, used in a repeat pattern across the Madonna’s dress, function both as a symbol of protection and as a signifier of surveillance, suggesting that “we are watching you”. This denotes not just the singular Eye of Providence that sees all from everywhere, even from every dollar bill, but the watchful millions who observe the law-makers, the government and the oppressors. The banner that most strongly invokes precedents, bears the figure of a leather-jacketed woman echoing the pose of the hero in Orazio Gentileschi’s Baroque masterpiece David and Goliath (c.1605-1608). The heroine wields a broad-sword against a snarling dragon covered in sequined number eight, with the legend ‘REPEAL NOW!’ emblazoned in a swag above her head. According to Maher, this was “the first image that came to us” and again, this banner is underpinned by art historical references. It recalls the chained Andromeda being saved by Perseus, for example in Rembrandt’s Andromeda Chained to the Rocks (1630), but “this is a reversal of that scenario; it is a reclamation of women from art history, as well as from Ireland’s patriarchal history of church-state rule”. This piece also echoes in format one of the best-known British trade union banners, that of the Dock, Wharf, Riverside and General Workers Union of Great Britain and Ireland (c.1890) that depicts a muscled Hercules wrestling with a serpent in a ‘holy war’ against destitution, prostitution and exploitation. This format was translated by the artists to reflect the story of women’s lives under the Eighth Amendment in Ireland, presenting a series of vignettes that include: a naked woman being pulled in two directions by a mitred bishop and a wigged judge; an unlocked treasure chest of pregnancy tests; a giant needle; a teddy bear; a wad of cash; the hand of justice weighing the unequal lives of a man and a woman; and a wheel of fortune denoting how, as described by Fallon, “access to reproductive rights is often a matter of luck”. In addition, traversing through the composition, is an endless line of women dragging suitcases, a reference to the thousands who go abroad every year to access abortion services. As well as the central imagery, the artists drew on the decorative elements – including the scrolls, fringing, frogging and borders – that solemnified and bedazzled the nineteenth-century antecedents featuring in their research. It took a lot of labour. Fallon’s embroidery of the eyes alone (on the Madonna of Repeal) involved more than 100 hours of needlework. Much of the making was done via correspondence, with the silk, drawings and embellishments circulating between the three artists until they came together in Maher’s studio in Mayo in an atmosphere of “joyful creation” (as described by Maher). In the history of public ritual, the central banner for each organisation was always accompanied by smaller ‘bannerettes’, often of more a playful design. 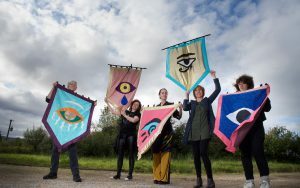 This format was also adopted by the artists, who walked with a set of smaller silk banners created by Áine Phillips, each featuring a different eye and a letter spelling out R-E-P-E-A-L. Phillips’s banners were a further testimony to the ‘all-seeing eye’, a witness to both the dire effects of Ireland’s laws and the tens of thousands who take to the streets each year to protest against them. If the history of women and textiles in Ireland can be dark and oppressive (overshadowed by institutions, laundries and work houses), then these artists have reclaimed a different version of history, setting their subversive stitches alongside those of the suffragette and Irish Women Workers Union banner-makers. For now, the artists’ banners are stored in Maher’s studio, ready to be unfurled and reactivated in upcoming protests, as we face into the referendum promised in 2018. 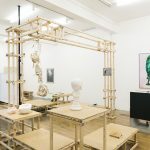 However, the banners’ future will ultimately lie in the National Irish Visual Art Library (NIVAL) in NCAD, alongside the drawings and documentation of their purposeful and happy invention. 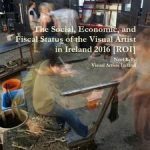 Dr Lisa Godson is Co-Director of the MA in Design History and Material Culture at the National College of Art and Design, Dublin. She is also Visiting Research Fellow at the Centre for Gender and Women’s Studies, Trinity College Dublin. Images: Artist’s banner; photograph by Alison Laredo. Artist’s banners, L–R: Alice Maher, Rachel Fallon, Breda Mayock, Áine Phillips and Lisa Godson; photograph by Alison Laredo. Banner-making; Breda Mayock; photograph by Alison Laredo.